Patents for a double ended locomotive type boiler, which was to become a characteristic feature of all "Yorkshire" wagons, and the transmission to the rear axle were taken out by Joseph Clayton and George Hutchinson Mann in 1900. Joseph Clayton was a director in the firm of Clayton, Son and Co. Ltd. of Moor Works, Hunslet and George Mann was the brother of James Hutchinson Mann owner of Mann's Patent Steam Cart and Wagon Co. Ltd., Pepper Road, Hunslet, Leeds. 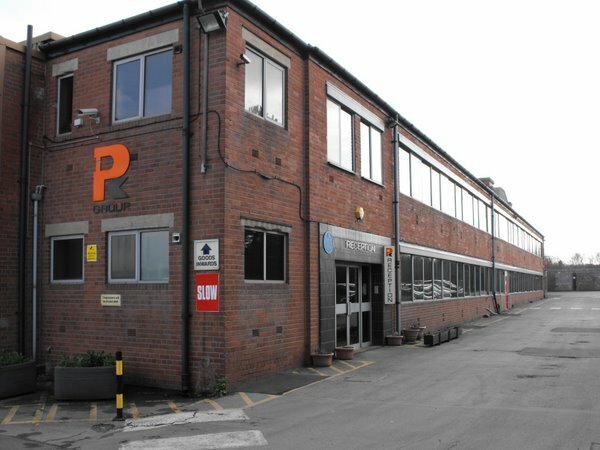 The first wagons were produced under the name of the "Yorkshire Steam Motor Company" at a small works in Ingham Street, Leeds in 1901. In 1902 the company was purchased by Deighton's Patent Flue and Tube Company Ltd. and the name was changed to the "Yorkshire Patent Steam Wagon Company" with the sub-title "Branch of Deighton's Patent Flue and Tube Company Ltd". In 1903 the works moved to a new site, alongside the parent company's works and those of Mann's in Pepper Road. The name of the company was changed in 1911 to the "Yorkshire Commercial Motor Company" (retaining the sub-title). The change was adopted to reflect the firm's short lived diversification into the production of internal combustion engined vehicles. 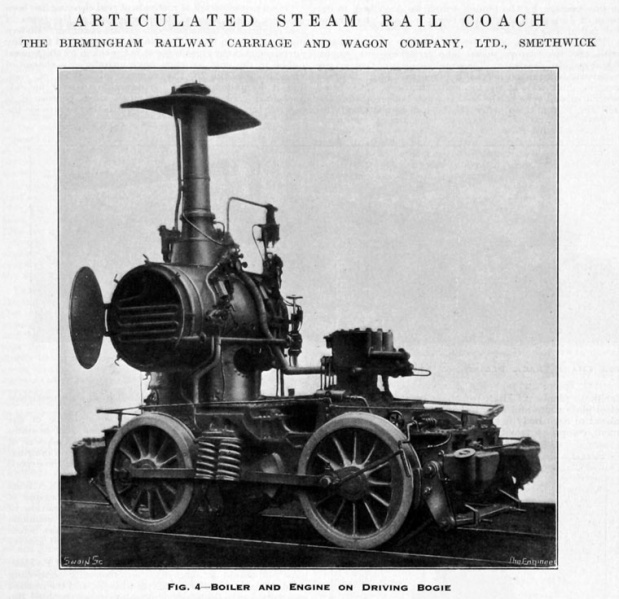 In 1922 it was decided by the directors of Deighton's Patent Flue and Tube Company Ltd. that the name of the steam wagon side of the business did not emphasise the type of vehicle that they manufactured and the name reverted to "Yorkshire Patent Steam Wagon Company" again retaining the sub-title. A further change of name did not occur until 1971 when the name of the parent company was changed to "Yorkshire Vehicles Ltd"; 34 years after the last steam wagon had been made at the works. The company was finally dissolved in 1993. 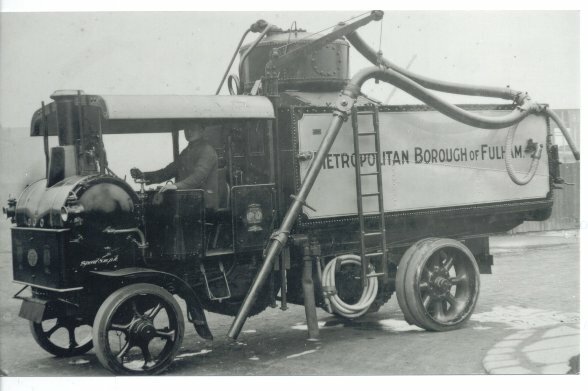 The first engine used was a two cylinder compound with the cylinders mounted one on each side of the chassis; the high pressure on the off side and the low pressure on the near side. The valves were actuated by a single eccentric reversing gear, similar to that used by Mann's. Sliding gears on the crankshaft driving onto the second motion shaft provided two speeds. The differential was mounted on the second shaft and gears drove the rear wheels. An early modification was to move the differential onto the rear axle which reduced the number of gears required in the transmission. In late 1906 a new design of engine was introduced which radically altered the layout of the wagon. The engine was now fully enclosed in a cast iron crank case and was mounted vertically between the frames inside the cab. Hackworth valve gear was adopted and drive to the rear axle was by roller chain. The revised layout had the gearing mounted on an extension of the crankshaft, which gave "Yorkshire" the opportunity to offer three speed versions of the wagon. 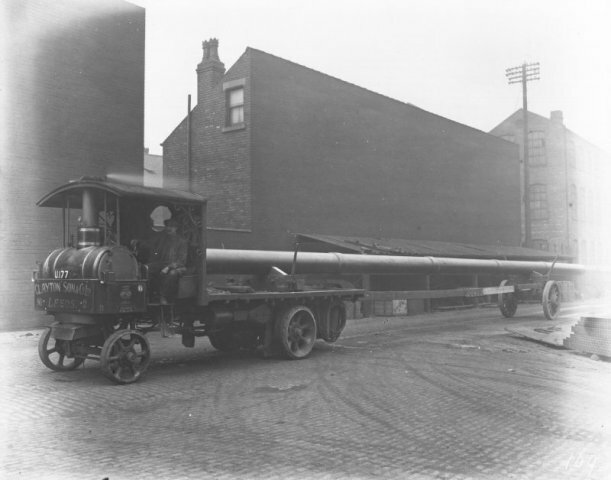 Most of the boilers used in the production of "Yorkshire" wagons were supplied by Clayton, Son and Co. Ltd., the directors of this company also being directors of Deighton's Patent Flue and Tube Company. There are records which show that Ruston Proctor of Lincoln also produced several boilers. The original boilers had a square firebox but the boiler was subject to a programme of continual improvement and a circular firebox, to reduce number of stays required in the firebox sides, was patented in 1909. At about this time the wagons were given type references: WA 6 ton, WC 4 ton and WE 3 ton. With modifications, the WE type remained in production until 1931, by which time it must have seemed a thoroughly antiquated machine with its open gears. 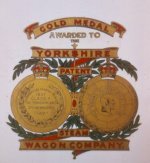 In 1907 the company entered a vehicle in the RAC trials where it won a Gold Medal in Class F. An image of the medal was included on the transfers applied to later Yorkshire wagons. Yorkshire number 70 of 1905 which spent its life with Clayton, Son & Co. It had been converted to steel wheels with rubber tyres and received a new boiler in 1917. It was last licensed in 1929. The basic layout of the "Yorkshire" remained unchanged from 1906 until 1922 when the WF shaft drive wagon, designed by Walter J Lewin, was introduced. The engine in this wagon was turned through 90 degrees so that the crankshaft was in line with the gearbox and prop shaft. Hackworth valve gear was retained but piston valves were now used. Lewin left Yorkshires in 1923 and joined John Fowler (Leeds) Ltd. as Works Manager where he led the design of Fowler's attempt to enter the steam wagon market. Lewin's patents, held jointly with the Yorkshire Patent Steam Wagon Company, were used in the Fowler wagon which as a result shared many features with the WF model Yorkshire including the option of a Gully Emptier body. Gully Emptier number 1378 of 1922. In 1926 the WG Yorkshire was unleashed onto the market. This wagon had independent chain drive to the rear wheels, the differential was incorporated in a countershaft unit, which was required to turn the drive through 90 degrees as the crankshaft was still mounted in line with the chassis as on the WF model. The engine was much improved; Joy valve gear had been adopted and the two gears were accommodated within the cast iron crankcase. The same arrangement was used on the later shaft drive WH model and six wheel WJ model. 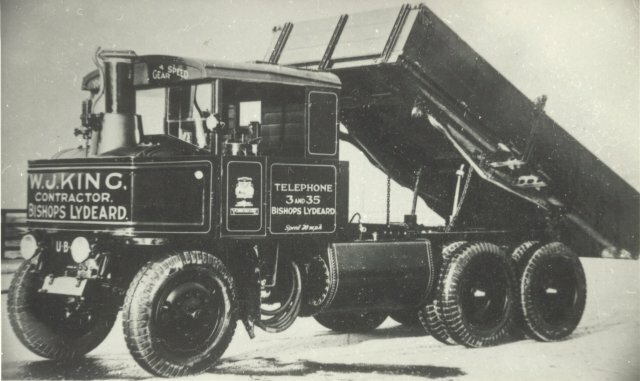 WJ model six wheeler number 2184 of 1931 with four speeds and pneumatic tyres. The last "Yorkshire" steam wagon, a shaft drive WH model number 2271 left the works in 1937. In 1918 a Yorkshire steam bus took to the roads. This was the result of fitting a trolleybus body constructed by Leeds City Tramways which was earmarked for a David Brown chassis that wasn't forthcoming to a Yorkshire steam wagon chassis. Yorkshire chassis number 947 was a variant of the standard 3 Ton steam wagon chassis adapted to take the bus body, it had three speeds: 5, 8 & 16 miles per hour. 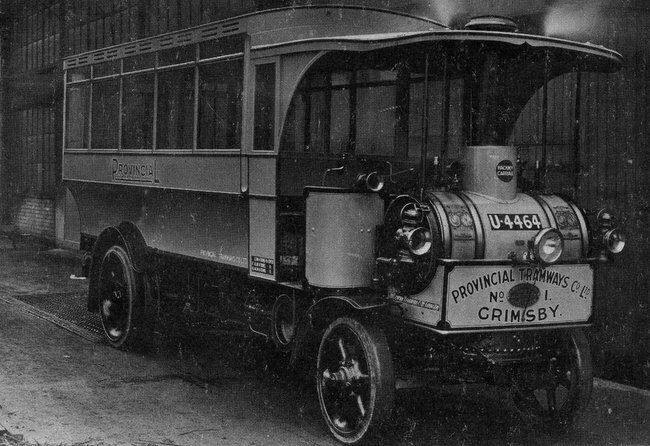 The bus went to Provincial Tramways in Grimsby but only saw a year in use as a bus before being rebuilt in to a conventional steam lorry following a collision with a tram. The bus body was reused on a petrol bus chassis. More about this steam bus can be read in our Bus Making article, together with a picture of the bus during its career in Grimsby showing a couple of modifications it received in service. Above - Film footage of the Stronach-Dutton Roadrail System in the British Film Institute archive. The Yorkshire wagons can be seen 12 minutes in to the film. Click the image above to play. Around 1923 two of the many Yorkshire steam wagons supplied to South Africa via Bell & Gifford were converted to experimental road rail vehicles. 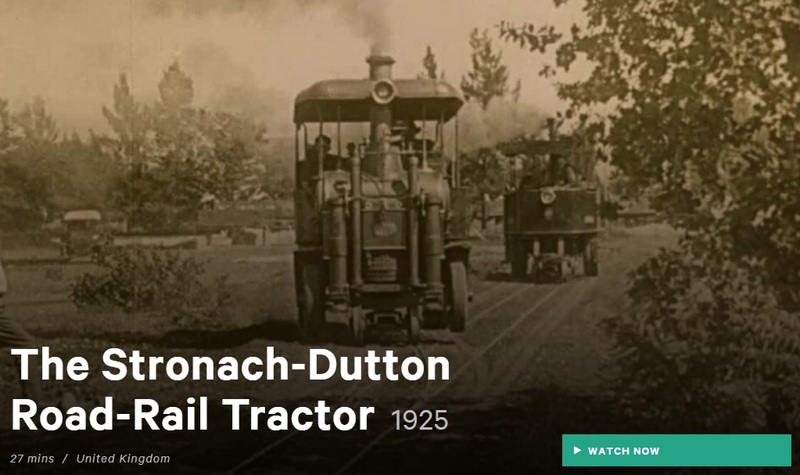 The system was known as the Stronach-Dutton Roadrail System, the idea was that rail bogies guided the vehicle while traction was provided by the road wheels either side of the narrow gauge track. This allowed cost savings in the railway construction as lighter rails could be used. The road rail tractors could be lifted off their guiding bogies and fitted with conventional road wheels to continue their journey beyond the extent of the railway. The two converted Yorkshire wagons were rebuilt by Brittannia Engineering Co Ltd in Johannesburg and were of two different designs. Y2017 became South African Railways number RR973 and its rebuild consisted of jacks to lift it of its front steering wheels and replace them with a rail bogie. The other example, SAR No RR1155, was extensively rebuilt so it could operate in either direction without turning by means of bogies in front and behind of the driving wheels. The boiler was repositioned over the centre driving wheels and one of the rail bogies was on a detachable articulated section. It is not known which of the many wagons sent to Bell & Gifford was the donor for this rebuild. The experiment was not successful and the road rail wagons were replaced with a conventional locomotive. More on this system, and a few photos of the Yorkshire examples can be seen on this website. In the early 1930s Yorkshire supplied boilers and engines to power steam railcars built by Birmingham Railway Carriage and Wagon Co. These were fitted to articulated two car railcars supplied to Entre Rios Railway, Egyptian State Railways, Belgian National Railways and others. Little seems to have been written about these railcars but illustrations from publications of the time are available on the Graces Guide website. The Derby Sulzers website records a demonstration run. "brand new [BRCW built Underground] motor coaches 240 & 241 worked a special train of railway officers and technical press on March 26th 1930 from Baker Street to Wembley Park (and return) to connect with a demonstration run of a BRCW built articulated steam railcar between Wembley Park & Aylesbury and return. 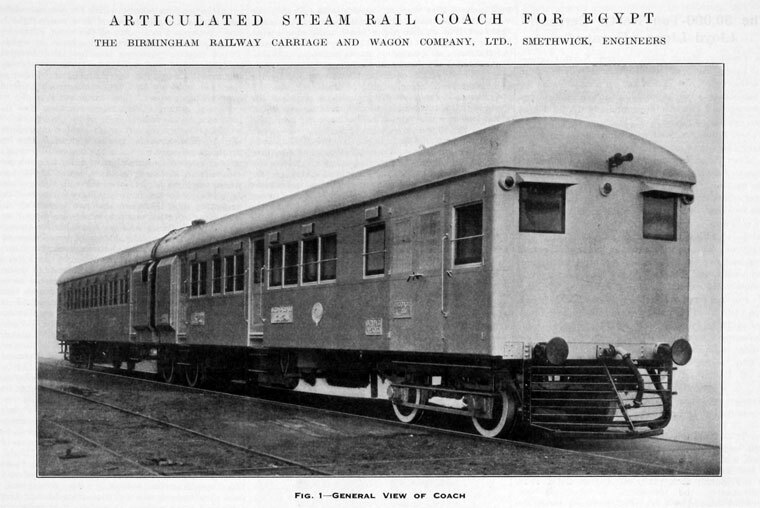 The steam railcar was for operation on the Egyptian State Railways. Included in the dignitaries were Nigel Gresley & C B Collett, amongst others." In recent years the works has been taken over by Pickersgill Kaye, a specialist lock maker. Amongst the products made by the firm are many door components for the railway industry. One of the biggest contracts won by the firm is the order for emergency door release handles for Hitachi's Intercity Express trains for the Great Western and East Coast Main Line. Parts for the preproduction trains were sent to Japan but the rest of the order will be built at Newton Aycliffe near Newcastle. The company also made metal components for the restoration of Leeds horse tram 107. Pickersgill Kaye has a long history in this area, Kaye made oil cans in Horsforth since Victorian times. Archive material from Yorkshire PSWCo is held by the West Yorkshire Archive Service including order books from 1903 to 1924. We have entered the works list details in to our database of Leeds built engines, however some details are still missing from 1924 to the end of steam wagon production in 1931. Surviving Yorkshire Steam Wagons page for details of the few examples that are still extant.